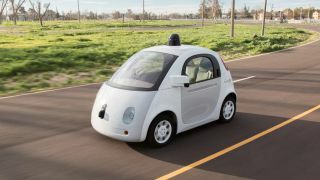 The Google car: unplugged from drivers and chargers? Google may be playing with wireless charging for its self-driving cars, suggest newly uncovered documents. The documents, filed with the US Federal Communications Commission (FCC) last year and spotted by IEEE Spectrum, reveal applications and permissions for the installation of wireless chargers from Hevo Power and Momentum Dynamics at locations where Google is testing its driverless cars. The wireless charging systems from both companies use a receiver attached to the vehicle to charge the car as it passes over plates placed on a driveway or road. The system essentially works like a phone or wearable wireless charger, just on a larger scale. Wireless charging systems for vehicles are usually set up in driveways at the home or office so cars can charge over a period of time. More recently, however, there trials have been conducted where the charging plates are embedded into roads or highways so electric vehicles can charge wirelessly while you drive. In addition to being incredibly novel, wireless charging might be the perfect system for Google's self-driving cars: the vehicles may end up intended not as purchases for individuals but rather as a public transport or fleet-type solution, and wireless charging could keep them on the road without having to stop and have a person plug them into a charging station. Still, it's unclear if Google is testing Hevo Power and Momentum Dynamics as an on-road wireless charging solution or if the cars would need to parked in order to be charged. Either way, it's obvious Google wants to make driving as much of a hassle-free experience as it can.